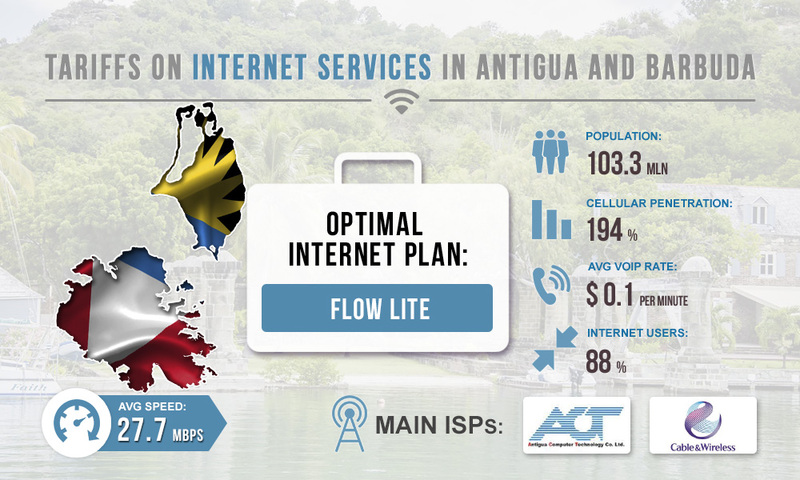 The network technologies market is actively developing in Antigua and Barbuda. The country do not demonstrate a very good indicator of the average Internet speed yet (2.7 Mbps), but in large towns and cities it is possible to connect more high-speed Internet. Let's see how much the Internet services in Antigua and Barbuda cost for work in the field of voice traffic termination. Lite. The Internet data limit is 20 GB, the cost is $57 per month. Basic. The Internet data limit is 48 GB, the cost is $72 per month. Essential. The Internet data limit is 100 GB, the cost is $87 per month. Plus. The Internet data limit is 150 GB, the cost is $108 per month. Ultra. The Internet data limit is 250 GB, the cost is $132 per month. The most preferable option will be the Lite package from Flow. The data limit is sufficient to effectively terminate calls using voip pbx hardware (20 gigabytes). At the same time, the cost is minimal, which allows reducing business expenses. Flow represents this range of Internet plans as “super-speed”, but if the speed is not sufficient for normal operation of the gateways, use software tools to increase the bandwidth of your Internet network. The SBO traffic optimization module from GoAntiFraud compresses the data three times, while not causing damage to voice traffic.